Are you a college student smack in the middle of your exam season and you just realized that the traditional miracle elixirs (energy drinks and coffee) are not really working that well anymore? Are you a competitive young professional looking to get an edge over your coworkers, when the big boss starts considering whose idea is brilliant enough to land them that prestigious promotion? Or maybe you would just like to learn about boosting your brain without us guessing at who you are? No problem, fam, we got you covered in every situation. Take a look at this condensed guide to the world of nootropic drugs that we put together for you and see how you can supercharge your brain power with their help. What are nootropic drugs anyway? Nootropics themselves are a group of chemical substances which have the effect of improving brain functions like memory, mood, or focus. Nootropic drugs are, for lack of a better word, supplements that have these substances as their active ingredients. You can learn more about active ingredients and the structure of medicines at this link. Some of the other names for these supplements that you can come across are cognitive boosters, memory enhancers, neuro-enhancers, or brain boosters; however, a nootropic drug is not the same thing as a “smart drug”. How is a nootropic different from a “smart drug”? 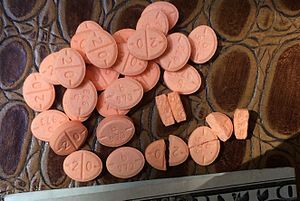 A group of 20 mg Adderall tablets, some broken in half, with a lengthwise-folded US dollar bill along the bottom (3.07 inches; 7.8 cm) for size comparison. Photograph by Seppi333. Like we already said, nootropics are targeted at enhancing learning and memory; in other words, they improve the natural cognitive abilities and protect the brain from influences that would reduce those abilities. They will never depress or stimulate the brain (will never “stone it” or “give it a high”). Smart drugs on the other hand are exactly that – drugs. These are regular prescription pharmaceuticals but used for things that they are not meant for. They are most commonly prescribed in treating narcolepsy or ADHD, since they stimulate the central nervous system. The most well-known ones are dextroamphetamine (Adderall) and methylphenidate (Ritalin). These substances trigger spikes in the levels of norepinephrine and dopamine, which in a person with genuine clinical ADHD issues helps them to focus and balances their energy levels. These and similar stimulants have side effects that include sleep problems, mood swings, anxiety, irritability, plummeting appetite, and cardiac problems, and they are also addictive. What kinds of nootropic drugs are there? Piracetam 800 mg tablets. Photograph by MT2013. In general, you can classify them into two broad categories: natural and synthetic. Whether you will use one or the other is often determined based on the effect you are trying to achieve. Luckily though, you will not need to waste a whole lot of time on picking and choosing – each category features only about two dozen nootropics, and when you have specific goals in mind, they can really narrow down your search. Let us say, for example, that you want to increase your focus and boost your memory. In your brain, this is achieved by producing a neurotransmitter chemical known as acetylcholine. To increase its production the completely natural way, you would need to increase the amount of healthy fats in your everyday diet – these fats are the “natural nootropic source”. They contain choline, the precursor of acetylcholine, and you can find them in eggs, almonds, cauliflower, spinach, milk, and whole host of other groceries. Synthetic nootropics are derivatives of stuff the body already produces. Opt for these lab-grown boosters if you are looking for more immediate, more noticeable effects. One of the most common ones is piracetam (sold in many places under the name “Nootropil”). If you are wondering about which ones are popular or what works best for your specific needs, you can always check out a review and recommendation community such as BestNootropicsNow. What are the risks and precautions for nootropic drugs? Piracetam formula(C6H10N2O2); drawn by Mykhal in bkchem and GIMP and uploaded to English Wikipedia here. As we mentioned when comparing them to smart drugs, a nootropic has to be proven safe, non-addictive, and non-toxic to humans. Moreover, most of them tend to have no, or barely any, interaction with other prescribed drugs, so they would not complicate any current therapy or any health condition. However, you must be very careful with the recommended dosage and whatever potential side effect is listed on the packaging of your chosen nootropic drug. Anything that causes changes in your dopamine or serotonin levels is not to be trifled with, especially if you are in any kind of anti-depressant medication regime. Just like any other supplement (think melatonin or zinc), nootropics can cause complications if you ignore the usage instructions and go overboard because you are too eager or impatient. While you are not likely to die from an overdose, you could certainly create problems for yourself, just as with another excessive supplementation. For example, overuse of the racetam-family substances can result in characteristic headaches (caused by drastically heightened acetylcholine processing) which will flare up in targeted areas of the brain. There will typically be some strategies available to alleviate these undesired effects, but why would you be sorry when you can be safe in advance? Although it may be tempting to think “more pills are more powerful”, slow and steady gives the best results. Question for students: Have you heard of nootropics before reading this article? Please let us know in the comments section below this article. Hager, Thomas. Ten Drugs: How Plants, Powders, and Pills Have Shaped the History of Medicine. Abrams Press, 2019. The featured image in this article, a space-filling model by Jynto (more from this user) of the ciproxifan molecule, a drug proposed as a treatment for narcolepsy, is made available under the Creative Commons CC0 1.0 Universal Public Domain Dedication. Previous ArticleReal Life Versus Fictional Badass Women! January 18, 1884: William Price, Welsh Nationalist, Chartist, and Druid!